There are 26 product(s) on this page. 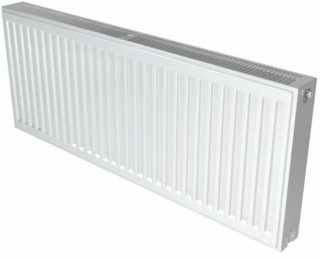 The Stelrad Energy Saving Radiator now avaliable from PlumbNation. The Stelrad Radical Radiator uses more Radiant Heat rather than Convection Heat to produce a more energy efficent radiator. The Radical uses centre positioned pipe inlet connections, and unique flow intake technology to produce 50% more heat from the front panel than a standard radiator. Radiant Heat can help achieve the feeling of high temperatures, but a lower settings. The Stelrad Radical will reach its maximum temperature 23% faster than a standard radiator, saving you energy and money! Save up to 10.5% on heating bills. Significantly less heat loss from the back of the radiator. Produces more Radiant Heat rather than less efficent Convection Heat. Can reach temperatures 50% higher than standard radiators. Can reach these temperatures in just 2 minutes! 23% faster heat up times. Valves included in the price! Pre-set & Pre-fitted TRV included. Valve Options - 10mm angled, 10mm str, 15mm angled, & 15mm str.